This pink and brown toile baby bedding is just HEAVENLY! The angel print fabric has all the best features of many popular nursery themes in one neat package. 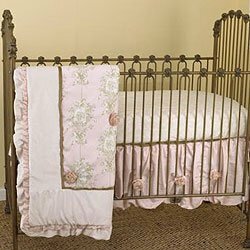 I had never considered cherubs as a possibility for a pink and brown nursery theme until I saw this unique crib set. Now it's at the top of my list of room designs to consider; oh the possibilities! I plan to use a dark oil bronze metal crib similar to the one in the photo if I can find one in my price range. If I can't I will shop for a wooden crib with an equally dark finish. I'm pretty sure that I will go with the pink and brown toile baby bedding but I need some help choosing a paint color. The product description states that the colors included in the toile print fabric are actually pink and taupe (which is just a softer, pinker shade of brown, right?) but there seems to be some white as well as antique ivory in the mix so there are many possibilities for choosing a neutral wall color but which one? The paint color in the background of the baby girl nursery picture featuring the crib set (on my monitor at least) resembles a color that I used once called Vanilla Bean and it has yellow undertones. I learned quickly that I prefer a hint of cool, blue rather than warm tones. Yet, I know that I don't want a pink wall which leads me to ask whether a taupe wall would be too pink? I hope that someone that sees this post on Unique Baby Gear Ideas that has more decorating experience than me can offer some advice before I go shopping for paint. I wonder if there is a lamp shade that I could buy to go with this collection or if there is fabric available by the yard so that I could make my own? Does anyone know? I think that a very light shade of taupe paint for the walls would work beautifully. Dark brown or tan would take away some of the softness and feminine appeal of the elegant toile baby bedding set that you have in the picture. By the way, did you have the pink and brown toile nursery bedding custom made? If so, what was the name of the fabric that you used. If not, what is the name of the bedding collection, what was the price if you don't mind me asking and where can I find it? Please post pictures of the room when you're done!